INFORMACIONES Y REPORTAJES. FERIA NACIONAL DE LA INDUSTRIA NAVAL Y DE MUESTRAS DEL NOROESTE. EN EL FERROL DEL CAUDILLO. AUTOPISTA BILBAO-BEHOBIA. 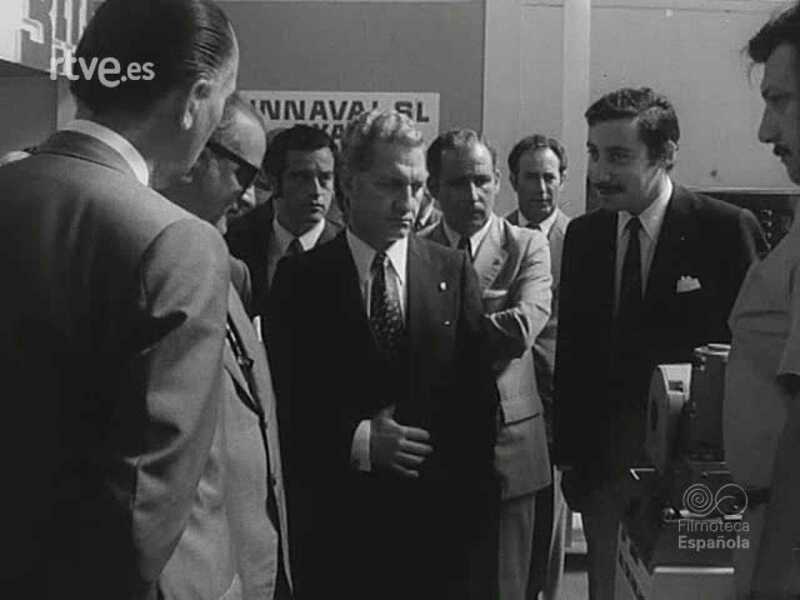 INAUGURACION DEL TRAMO "ZARAUZ-SAN SEBASTIAN". EL ARTE DE LOS INCAS: LABRADO DEL METAL POR LOS PROCEDIMIENTOS MAS PRIMITIVOS. EXPOSICION DE PARTE DEL TESORO DEL MUSEO "ORO DEL PERU", EN MEJICO. FUTBOL. EL "HERCULES", DE ALICANTE, INAUGURA ESTADIO. ENCUENTRO CON EL BARCELONA Y DIVERSOS ACTOS. PAGINA EN COLOR. EL "HOTEL DE LA RECONQUISTA", DE OVIEDO. ESTABLECIMIENTO DE GRAN CATEGORIA INSTALADO EN EL ANTIGUO HOSPICIO Y HOSPITAL DEL PRINCIPADO. INFORMACIONES. ENTREGA DE TITULOS A EMPRESAS MODELO Y TRABAJADORES EJEMPLARES. ACTO PRESIDIDO POR S.A.R. EL PRINCIPE DE ESPAÑA. LOS PRINCIPES DE ESPAÑA PRESIDEN LA RECEPCION EN LOS JARDINES DE LA GRANJA. CON MOTIVO DEL XXXVIII ANIVERSARIO DEL ALZAMIENTO NACIONAL. VELA. CAMPEONATOS DE EUROPA DE EMBARCACIONES A VELA, CLASE "470". LAS TRIPULACIONES FRANCESAS, VENCEDORAS ABSOLUTAS EN AGUAS CATALANAS DE MASNOU. REPORTAJES. FERIA AEREA EN BIGGIN HILL, INGLATERRA. ACTUACION DE UN EQUIPO FEMENINO DE PARACAIDISTAS. EL BAILARIN ESPAÑOL ANTONIO GADES, EN SU "TOURNEE" POR EUROPA. CLAMOROSO EXITO EN HUNGRIA. PAGINA EN COLOR. MODAS EN POMPEYA. EXHIBICION DE MODELOS AL PIE DEL VESUBIO. INFORMACIONES. NUEVOS CONSULTORIOS DE LA SEGURIDAD SOCIAL, EN MADRID. PARA LA ASISTENCIA A LOS TRABAJADORES. INAUGURACION DE VARIAS CARRETERAS Y OBRAS DEL "PLAN DE CERCANIAS", DE MADRID. EN EL XXXVIII ANIVERSARIO DEL ALZAMIENTO NACIONAL. "ARTE PARA CADA CUAL". INNOVACION EN LAS TRADICIONALES FIESTAS VIENESAS. DEPORTES. LIV CAMPEONATOS DE ESPAÑA ABSOLUTOS DE ATLETISMO. EN EL ESTADIO VALLEHERMOSO, DE MADRID. LUCHA LIBRE ENTRE COCHES, EN INGLATERRA. UN DEPORTE QUE HACE FELIZ A LOS CARROCEROS. PAGINA EN COLOR. PEINADOS AL AIRE. EXHIBICION EN UN PARQUE DE ATRACCIONES BARCELONES. PIRAGUISMO. XI DESCENSO INTERNACIONAL "PIRINEOS DE LERIDA". LA COMPETICION SE HA CELEBRADO EN EL RIO NOGUERA-PALLARESA. INFORMACIONES Y REPORTAJES. LOS PRIMEROS HIPOPOTAMOS ENANOS ESPAÑOLES. EXHIBICION DE UNA PAREJA EN EL ZOOLOGICO DE BARCELONA. MARIONETAS DEL MEJICANO JAVIER TENORIO EN LA CAPITAL AZTECA. LA VIEJA COMEDIA DEL ARTE CON ROPAJE MODERNIZADO. VENECIA, AMENAZADA POR LAS AGUAS. LA CIUDAD MAS VISITADA DEL MUNDO, SE MUERE. PAGINA EN COLOR. XXV CAMPEONATOS DE TIRO CON ARCO. EN LA CIUDAD DEPORTIVA DEL REAL MADRID. DEPORTES. REGATA DE YATES "CORUÑA-PORTSMOUTH". SALIDA DE LOS COMPETIDORES DEL PUERTO GALLEGO. BOXEO EN EL MADRILEÑO CAMPO DEL GAS. EL ESPAÑOL PEDRO FERNANDEZ, NUEVO CAMPEON DE EUROPA DE "SUPERLIGEROS". REPORTAJES EXTRANJEROS. LA PROTECCION A LA NATURALEZA. MEDIDAS PARA DEFENDER A LOS ARBOLES, EN AUSTRIA. "VUELE USTED UN POCO". UN DIVERTIDO CONCURSO DE LA TELEVISION HOLANDESA. PAGINA EN COLOR. BODA SUBMARINA EN AGUAS DE PALAMOS. LAS CAMARAS DE NO-DO, TESTIGOS DE LA CEREMONIA. INFORMACIONES Y REPORTAJES. EL "METRO" PUEBLO NUEVO-LAS MUSAS Y EL PASO SUBTERRANEO DE PEATONES, EN COLON. DOS NUEVAS OBRAS INAUGURADAS EN MADRID. DESAPARECE LA PLAZA DE TOROS DE SAN SEBASTIAN. UN VIEJO AFICIONADO DONOSTIARRA NOS CUENTA SU HISTORIA. LOS JARDINES DEL VATICANO, ABIERTOS AL PUBLICO. UNA EXPOSICION DE ARTE. NATACION. LXIV CAMPEONATOS NACIONALES. EN EL PARQUE SINDICAL DE VALENCIA. PAGINA EN COLOR. EXPOSICION DE FLORES EN CHELSEA. INGLATERRA. HORTICULTORES DE TODO EL MUNDO SE CONGREGAN EN ESTA FERIA LONDINENSE.